Whenever I return home from a trip there’s nothing my body and soul craves more than a deep bowl of soup and the appropriate carbohydrate to accompany it. Kimchi stew with overside blocks of tofu, pho with rare slices of steak and overflowing bean sprouts, instant ramen topped with a gooey yolk egg… I love my Asian soups in all forms and levels of spiciness. However, since my move to Spain my yearnings are rarely satiated. In fact, I forgot about Asian food in general here. I could have written a break up letter, something in the lines of I’m just not in love with you anymore. Luckily, there are a few flings I can always depend on like Mosquito, Sichuan and Nanit but I have never been wowed by any Asian restaurant in Barcelona. I’m glad to say this depressing streak ended by a very special restaurant. May I present, Wagokoro! A delightful and exciting beginning. The octopus dabbed with umeboshi sauce was superb! Kaiseki (懐石) is a traditional multi-course Japanese dinner. The term also refers to the collection of skills and techniques that allow the preparation of such meals. Black sesame pudding, wonderfully creamy with a flawless balance of deep nuttiness and sweetness in flavor. I could have eaten at least 2 more of this stellar dessert. Sitting a chair away was an older Japanese couple. They too nodded and “oh”-ed in great satisfaction after each bite. They told us about the unique tradition of kaiseki and the rarity of it outside of Japan, yet alone in Europe. I’m glad to say, I am in love again. Wagokoro offers a menú del dia (daily special) from 16.90 euros with drink and desert included. If you live in Barcelona you can also sign up for their monthly Japanese cooking courses. There are only set tasting menus for dinner that range from 39.50 to 54.50 euros. Sake can be ordered in full or half bottles. 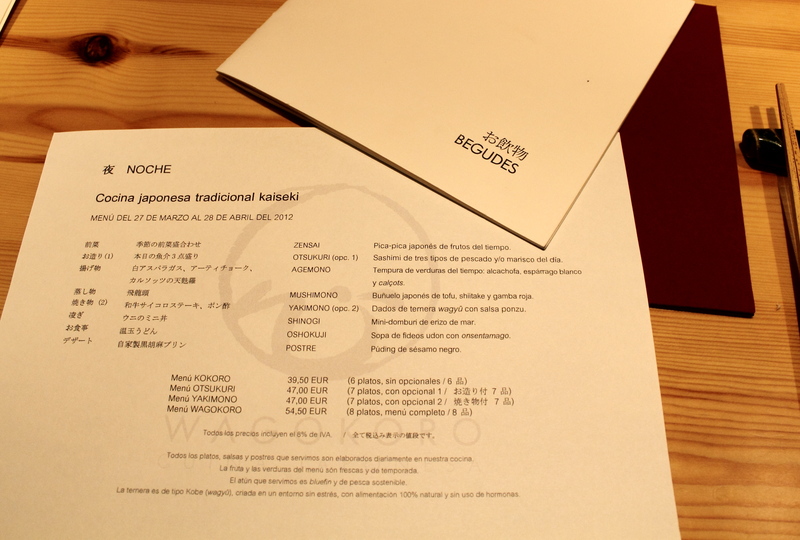 This entry was posted in Barcelona, Cities, Taste and tagged Barcelona, Japanese Cuisine, Kaiseki, Wagakoro. hahaha that’s highly doubtful! Although Isabelle’s post was spectacular. I really need to get myself to Japan!